Tags: Bush spending, debt, national debt, Obama spending, spending, who spent more? This entry was posted on July 27, 2012 at 5:00 am and is filed under Barack Obama, Conservative Issues, debt, Economy, first Jeremiah Wright term, George Bush, Politics, socialism. You can follow any responses to this entry through the RSS 2.0 feed. You can skip to the end and leave a response. Pinging is currently not allowed. The other day, I heard a talking head reference the Clinton budget surplus. Of course, the talking head was a lefty and didn’t know what he was talking about. Yes, Billy paid down the public debt, but he borrowed money from intra-governmental holdings (mostly social security) to do this. 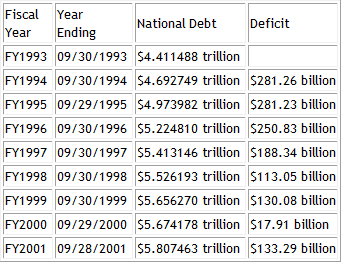 For those that don’t know, the national debt is public debt + intra-governmental holdings. When you add those two together, Billy never had a surplus, not even one year. Also, the Clinton government had the benefit of the Nasdaq stock bubble, which provided it with massive inflows of capital gains taxes to help offset the deficit. Of course, this was all just a bubble pumped up by easy money from the Fed. The wealth was fake, but the Clinton government benefited tremendously from it. If not for it, I am sure the deficits would have been far greater. Also, the republicans in both the House and Senate kept clintonomics from destroying the economy. Republicans, fighting tooth and nail, restrained Clinton from doing what liberals do best, and that is tax and spend. It is very simple: If Obama wins, we will be destroyed! Obama is a skinny, dumbo-eared Death Star. If Romney wins, he will still need an exorcist to come in and wrestle with all the thousands of demons that started filling that place on January 20, 2009. For the record, the article here is a pretty thorough demonstration of what Free Market Capitalist is describing. 1) The collapse of the Soviet Union in 1989-90 created a period of uncertainty for the world. Examples: how was Western Europe going to assimilate the Eastern European “Soviet bloc” countries as the USSR collapsed? What was going to happen to the many nations that had depended on the USSR for loans and assistance? For the most part, the market does NOT like uncertainty. This was in large part the reason for the recession that hit the Bush 1 presidency. By the time Clinton was in office, most of those issues had largely worked themselves out or been worked out. 2) Recessions generally don’t last that long unless turds like Obama run things, so the US began to surge back. And most times the surge results in an exceptional period of growth – again unless a turd like Obama is in charge. So the economy was bouncing back from its recession just as Clinton took office. 3) Bill Clinton was THE beneficiary of the so-called “peace dividend” that had been won by Reagan and Bush I. It was Reagan’s buildup that resulted in the collapse of the USSR, and Bush further expanded that collapse by prevailing over key former Soviet ally Iraq in the Gulf War. When Bill Clinton gutted both the military and intelligence capabilities of the US – which for the record resulted in a weak and blind US being unable to stop the 9/11 attack – he “saved” hundreds of billions of dollars in defense/intelligence spending. It was a foolish savings, but there is no question that Clinton politically benefitted from it. 4) The 1994 Republican Revolution was the result of a TERRIBLE Democrat Party and a terribly foolish first two years of the Clinton presidency. As a result, Clinton got a Republican House and a Republican Senate which – as Free Market Capitalist points to – provided the climate in which Clinton said, “The era of big government is over” and governed like a moderate Republican. And there is no question that these Republican policies, combined with the previous three things above, created a period of good strong economic growth. Did Clinton “raise taxes”? Yes, he raised the top marginal income tax rate. But he cut many other taxes, such as capital gains, which ultimately resulted in a net tax CUT for most investors.